A slim line of shimmering stones adorns this V-shaped ring, bringing glamour to its graphic design. Wear this sterling silver wishbone alone or stack it with other chevron rings in contrasting textures. Style tip - Stack with the Beaded Wish Ring and Shining Wish Ring for a textured ring stack or spread them across your fingers for a minimalist geometric look. New Wishbone rings are now available in smaller sizing so can also be worn as midi rings, placed between the fingernail and first knuckle. Available online or in concept stores only. Shimmering Wish Ring is rated 4.1 out of 5 by 55. Rated 5 out of 5 by YuYa from my favorite stacks I love that the ring is very simple and can be easily styled with different rings. I've been wearing them everyday for 3 months now, I clean them regularly, and they are as good as new. Definitely a must-have from pandora to add some style to your other pandora rings! Rated 4 out of 5 by Bex15 from Bought for my wedding! My only issue was the sizing goes from 7.5 to 8.5 and an 8 would have been a better fit. I bought this and the Shimmering Wish Ring for my wedding set. I wear them every day and they hold up really well. Im glad I bought them. 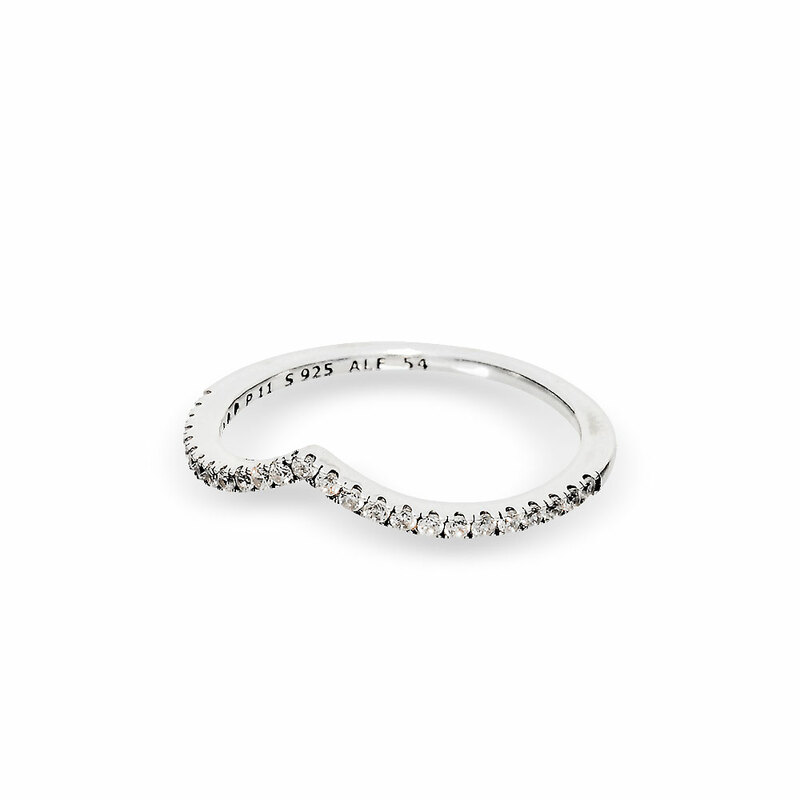 Rated 5 out of 5 by Jaz1217 from Love this ring! Stacks great with the large teardrop ring or alone as a midi ring. Also looks really good with the other two wishbone rings. Rated 1 out of 5 by Aolrnd from Bad quality I bought this two hours ago and wore it out of the store when I got home I looked at it and one of the diamonds had already fallen out. Very disappointed. Rated 5 out of 5 by Jackiexoxo10 from GORGEOUS but size issue ! My boyfriend, as a promise ring got me this for my birthday 3 days ago with the other ring and I LOVE THEM !!! Wish they carried a size 6.5 cause I had to get a ring guard them because they are a 7 and it's to big for me , however they are both super comfortable and super shiny! This ring though is a perfect ring to put with really anything , it is so beautiful and I wouldnt trade it for the world! Rated 3 out of 5 by allieg from Doesn't last long I got this for my birthday a little over a year ago and I had to go into pandora to get the same ring three different times because the stones kept falling out. I am currently on my fourth one and two of the stones have fallen out but since my one year warranty is up, I can't get a new one.